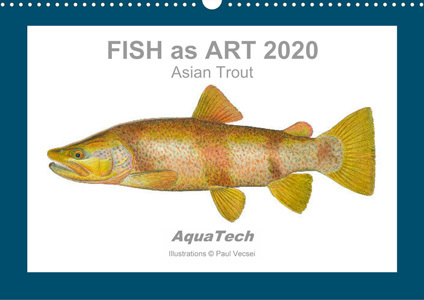 FISH as ART 2020 - Asian Trout. By Paul Vecsei. Spiral-bound, 14 pages. Wall Calendar DIN-A4 to DIN-A3. Paul Vecsei is an established fisheries biologist and fish illustrator. In this calendar, his work emphasizes some of the interesting diversity of trout (Salmonidae), featuring 13 unique illustrations. Each image represents an individual fish and was executed in detail using a variety of techniques. The morphological uniqueness of many of these species, forms or morphs has never been illustrated. The calendar is printed to ISO standards, on high quality multi-coated art paper (approx. 170 g/m2), and is FSC-certified. These spiral-bound calendars are available in landscape format DIN-A4 to DIN-A3 (Wall Calendar). 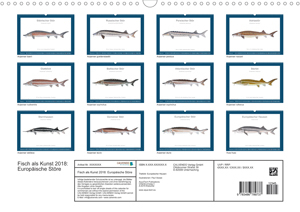 The calendar features a new specimen each month and makes for educational viewing of the diversity of our fishes. All calendars can be ordered from bookshops. Our Maritime Technic - Pontoon System is now also available in recycled material (black). This also reduces plastic waste, saves the resources and protects the environment. Min. order for this special price are 4 m2. Green products are no longer available. *Changes are possible without notice! 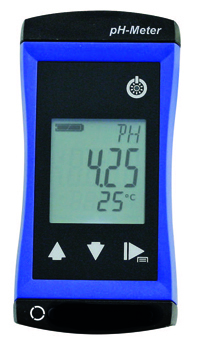 From the universal-pressure-smokers, which are proven since centuries, a new version in Gastro-Norm (GN) is available. Herewith all usual (GN 1/1 to 1/3) containers or grids from other kitchen equipment will also fitt in this smoking oven (or visa versa). This allows easy and better use in the professional kitchen. 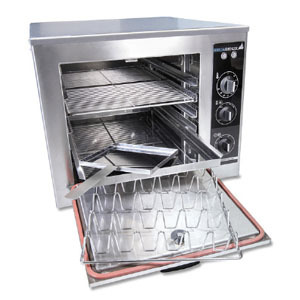 The new multifunctional smoker (WxDxH outside: 51,5x60,5x43,5 cm) in stainless steel with double wall, full isolation, has removable placements with 5 layers (distance 40 mm) for faster cleaning. It is delivered complete with each one GN 1/1 (32,5x53,0 cm) drip pan, flat grid (for fillets) and fish rack (for up to 12 table sized trout). In total up to 36 pieces of fish or 18 kg of meat will fitt into this gastro-smoker. All prices in Euro ex works, excl. VAT. 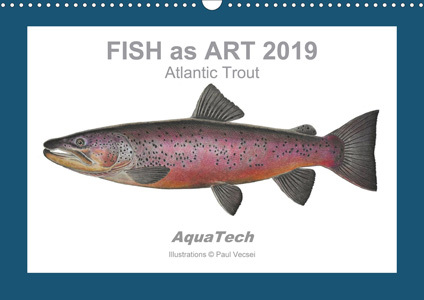 FISH as ART 2019 - Atlantic Trout. Wall Calendar DIN-A4 Landscape (297 x 210 mm), ISBN 978-1-325-32134-6 (EUR 40,- excl. VAT). Wall Calendar DIN-A3 Landscape (420 x 297 mm), ISBN 978-1-325-32135-3 (EUR 50,- excl. VAT). Paul Vecsei is an established fisheries biologist and fish illustrator. 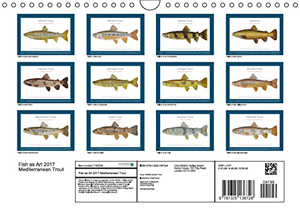 In this calendar, his work emphasizes some of the interesting diversity of trout (Salmonidae), featuring 13 unique illustrations. Each image represents an individual fish and was executed in detail using a variety of techniques. The morphological uniqueness of many of these sub-species or morphs has never been illustrated. The calendar is printed to ISO standards, on high quality multi-coated art paper (approx. 170 g/m2), and is FSC-certified. These spiral-bound calendars are available in landscape format DIN-A4 to DIN-A3 (Wall Calendar). 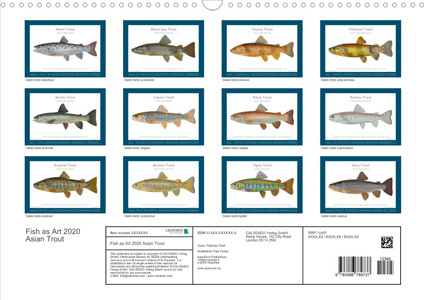 The calendar features a new specimen each month and makes for educational viewing of the diversity of our fishes. All calendars can be ordered from bookshops. We have a new production partner for our Maritime Technic - Pontoon System. The main plastic parts (pontoons, bolts, discs) are now "Made in Germany". The company is certified by TÜV according to DIN EN ISO 9001 : 2015. All prices are therefore ex works D-48477 Hoerstel/Germany. Min. order for this special price are 8 m2. or order as paperback (for US$ 9,-). By Patrick Williot, Guy Nonnotte, Denise Vizziano-Cantonnet and Mikhail Chebanov. 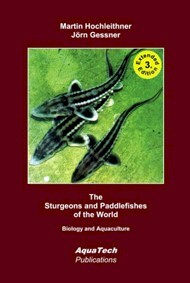 This two-volume book set focuses on the Siberian sturgeon. Acipenser baerii one of the "still existing” sturgeon species, is a native species of the Siberian catchments, where – as in many other parts of the world – the sturgeon populations are now threatened. Sturgeon farming practices targeting caviar and meat production have been expanding worldwide since the 1990s, and have seen a further increase since the turn of the century. Among the handful of sturgeon species used for significant production, the most dominant is the Siberian sturgeon. Given its peculiar phylogenetic position as a chondrostei and its use as a biological model in some countries, the species has also attracted the attention of biologists. The aim of the editors was to provide for the first time a comprehensive and updated synthesis regarding the farming-related biology of the Siberian sturgeon. In light of the abundance of material, it has been divided into two volumes, with a focus on biology and farming, respectively. The main parts of Volume 1 are biology and ecology, biology and physiology of reproduction, and ecophysiology. In turn, Volume 2 is divided into six parts: reproduction and early ontogenesis, growing, global production, long-term management of brood stock, state of health through welfare and immunology, and ecological risks of installation in non-native waters, illustrated by two long-term documented examples in Russia and France. 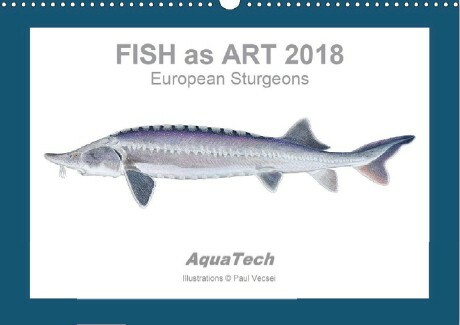 FISH as ART 2018 - European Sturgeons. 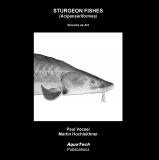 Paul Vecsei, a well known sturgeon expert and fish illustrator, shows in this calendars some of the interesting diversity of sturgeons (Acipenseridae), featuring 13 scientific illustrations. 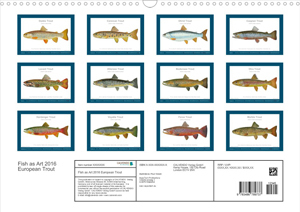 Each image represents an individual fish and was executed in various techniques. The calendars are printed in the actual ISO standard, on high quality multi-coated art paper (approx. 170 g/m2), which is FSC-certified. These spiral-bound calendars are available in landscape format DIN-A5 (Desk Calendar), as well as DIN-A4 and DIN-A3 (Wall Calendar). The calendars not only adorn any room but also provide each month with a new species for the viewer. All calendars can be ordered from bookstores. Wall Calendar DIN-A4 Landscape (297 x 210 mm), ISBN 978-1-325-24192-7 (EUR 40,- excl. VAT). Wall Calendar DIN-A3 Landscape (420 x 297 mm), ISBN 978-1-325-24193-4 (EUR 50,- excl. VAT). At the development of this new series of handheld meters we concentrated on the most important functions of the measurement technique. The pure measurement with the focus on precision, fastness and durability packed in a stable ABS-housing 108 x 54 x 28 mm (LxWxD), weight approx. 130-200 g (without sensor) with 4 simple touch-buttons, allows for an extraordinary relationship of price to value. This functional meters have a modern and egonomic design, are dust- and weaterproof (according to IP65/67) and have an illuminated 3-line display (accuracy: 0,5-1,5 % resp. +/- 1 digit at a norm temperature of 25 °C) with battery status. 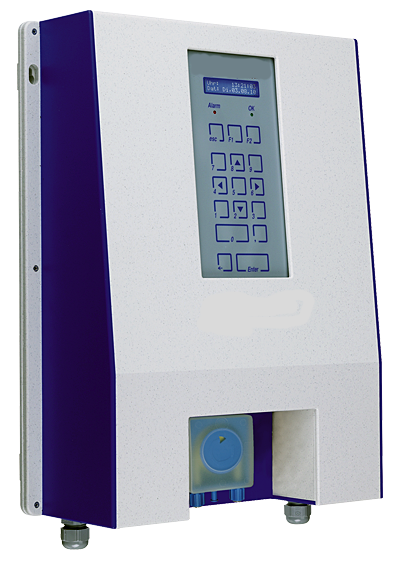 The meters have additional features, such as: automatic min-/max-value memory, hold-function, and an overhead display on push-button. This reasonable priced meters are delivered completely ready to use incl. battery (type AA), cable and sensor (12 mm Ø). Transport cases are available as accessoire. 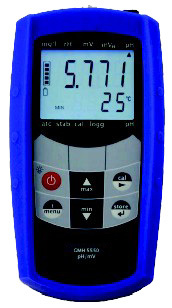 Controll solution (100 ml), EUR 10,- Manual temperature compensation. Optical laser oxygen sensor with conductivity measurement, on request. 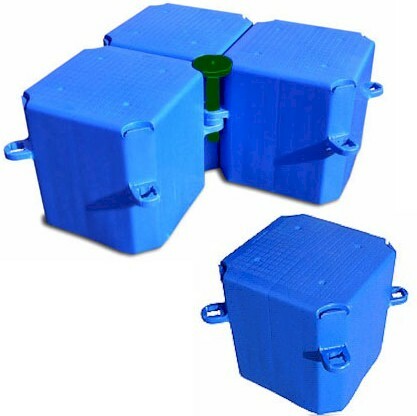 This UVC submersible emitters acts in order to sterilize water in pipes, canals, tanks and ponds etc. The diving emitters are made of stainless steel and accomplished as watertight. The (30 mm diameter) tube of the diving lamp is sealed up and screwed in the stainless steel (V4A) case. The unit can be assembled or retrofitted with few movements. The diving emitter gets fixed by spring terminals on a stainless steel fixture. The pre-switch electronics (230 V), properly attuned to the emitter, is included in the delivery and can be integrated in a switchboard. Consequently an access or function control during the operation of the unit are warranted. The fuse protection by a GFCI ground fault circuit interrupter is necessary. The lifetime of high-power radiation (Quicksilver or Amalgam) is 16.000 h - quality you can rely on. The 3 m cable between the lamp and ballast can be extended on request on 6 or 9 m. Simply installation and maintenance in existing plants and pools. The watertight emitter can be mounted with a mounting plate on the wall or bottom or floating or hanging without any plate. Adapted for wider ejecting (8-12 m), on request. Without timer and battery, on request. The new reworked and improved version (wall- and stand models) have a gutting head which can be removed without tools and is dismantled in seconds, which allows good cleaning and disinfection. 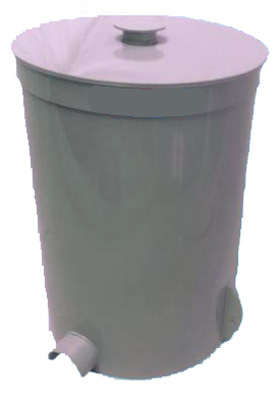 The removable suction head fitts to usual waste containers, which allows easy and fast replacing and deposition. Theese stainless steel gutting devices are delivered complete as table, wall or stand units with or without compressor and vacuumcleaner and with or without round rinsing brush. SHIP STURGEON (Acipenser nudiventris): A rare and interesting species which builds also freshwater resident populations (in the Ural and Danube rivers). The sucessfull rearing of this species within the European Union,will be presented for the first time at ISS8 (see below). 8th International Symposium on Sturgeons (ISS8), 10.-16. September 2017, BOKU, Vienna (Stand 13). 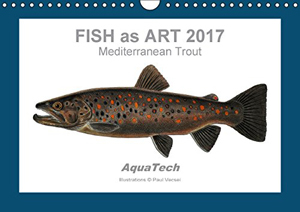 FISH as ART 2017: Mediterranean Trout. Paul Vecsei is an established fisheries biologist and salmonid illustrator. In this calendar, his work emphasizes some of the interesting diversity of trout (Salmonidae), featuring 13 unique illustrations. Each image represents an individual fish and was executed in detail using a variety of techniques. The morphological uniqueness of many of these sub-species or morphs has never been illustrated. The calendar is printed to ISO standards, on high quality multi-coated art paper (approx. 170 g/m2), and is FSC-certified. These spiral-bound calendars are available in landscape format DIN-A4 to DIN-A3 (Wall Calendar). 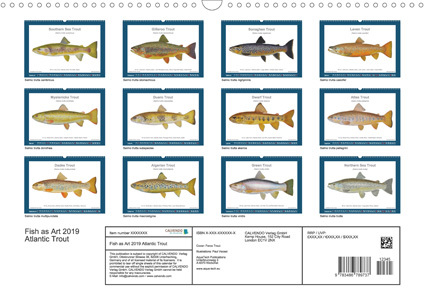 The calendar features a new specimen each month and makes for educational viewing of the diversity of our remaining trout. Additional editions are planned for the future. All calendars can be ordered from bookshops. Wall Calendar DIN-A4 Landscape (297 x 210 mm), ISBN 978-1-325-13672-8 (EUR 40,- excl. VAT). Wall Calendar DIN-A3 Landscape (420 x 297 mm), ISBN 978-1-325-13673-5 (EUR 50,- excl. VAT). 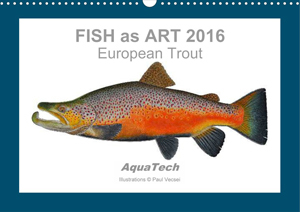 FISH as ART 2016: European Trout. Price EUR 40,- to 50,- excl. VAT. Wall Calendar DIN-A4 Landscape (297 x 210 mm), ISBN 978-1-325-10613-4 (EUR 40,- excl. VAT). Wall Calendar DIN-A3 Landscape (420 x 297 mm), ISBN 978-1-325-10614-1 (EUR 50,- excl. VAT). By Steven D. Mims and William L. Shelton (Authors), Hardcover, 320 pages. Paddlefish have become of increasing interest to the aquaculture community in recent years, particularly as a potential new source of seafood and caviar. Native to North America, paddlefish (Polyodon spathula) show great promise both domestically and internationally as a commercially viable farmed species. This book examines all aspects of the biology and culture of these fish, exploring their physiology, production, end products and the economics underlying a successful paddlefish operation. Chapters specifically cover paddlefish biology, propagation and early culture techniques, production for meat and caviar, international culture and history, paddlefish food products, bioaccumulants of contaminants in paddlefish, parasites and diseases, and the economics of paddlefish aquaculture. Paddlefish Aquaculture is a timely practical reference for researchers and producers interested in this species. By Patrick Kestemont, Konrad Dabrowski, Robert C. Summerfelt (Editors), et al., Hardcover, 901 pages. This extensive work focuses on an important group of temperate freshwater fish, approaching the topic from the perspectives of both biology and aquaculture. 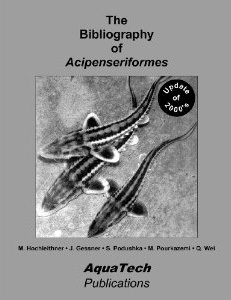 It compiles the latest research on fish belonging to the Percidae family and describes in detail all biological aspects relevant to the culture of different species, including ecology, reproductive physiology, feeding and nutrition, genetics, immunology, stress physiology and behavior. It also considers commercial fish production and fish farming topics, such as protocols for induction of gonad maturation, spawning, incubation and larval rearing. Expert contributors not only provide a critical peer review of scientific literature but also original research data, and identify effective practical techniques. The book features chapters on systematics, ecology and evolution, on development, metabolism and husbandry of early life stages and on growth, metabolism, behavior and husbandry of juvenile and grow-out stages. Furthermore, the authors consider genetic improvement and domestication, as well as diseases and health management, crucial to the readers' understanding of these fish and how they can be cultured. This new development is the first optical oxygen sensor with SCS interface (Simulation Clark-Sensor), for a perfect integration into running systems. 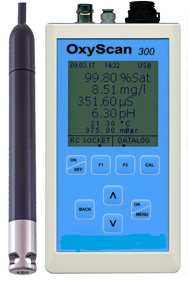 The ideal substitute for your existing oxygen sensors. Via the SCS interface downward compatible to classic oxygen sensors (galvanic isolation), works together with classic transmitters. Additionally, the sensor can be connected via the 4 to 20 mA current output or with a process control system (SPS). As acessoire, a PC-adapter (USB-RS485) is available, with which the sensor can be connected directly to a personal computer, and configures from there (Software for free), where just a net-device is needed and no external meter. The calibration is simple and only needed once as the calibration data can be stored in the sensor. The robust and simply exchangeable sensor cap has a warranty of 2 years. It guarantees stable values at once, little drift, quick reaction time, and all independent from incoming flow. The sensor has no no sensitivity towards H2S or CO2, but an automatic temperature compensation and malfunction diagnosis. Measrement range 0-20 mg/l, 0-200 % sat., resolution (at 25 °C) +/- 1 %, limit 0.1 %, reaction time < 60 s, temperature range -5 to +50 °C. The sensor can be delivered with an IP68 termination plug or with a fixed cable in different lengths. For mounting in a probe holder the sensor can be delivered optionally with a 1" process connector. For fish farming there is a robust version with a biting-protection with nut inserts available for water depth up to 20 m.
Asian Sturgeons (Acipenseridae): Fish as Art. Wall Calendar DIN-A4 Landscape (297 x 210 mm), ISBN 978-1-325-04427-6 (EUR 40,- excl. VAT). Wall Calendar DIN-A3 Landscape (420 x 297 mm), ISBN 978-1-325-04428-3 (EUR 50,- excl. VAT). 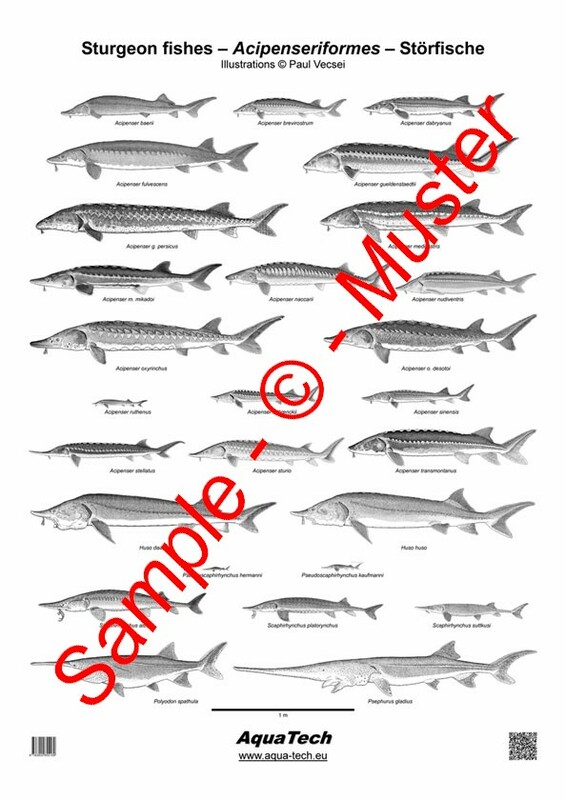 Paul Vecsei, a well known sturgeon expert and fish illustrator, shows in this calendars some of the interesting diversity of sturgeons (Acipenseridae), featuring 13 scientific illustrations. Each image represents an individual fish and was executed in detail in the technique of pointillism. The calendars are printed in the actual ISO standard, on high quality multi-coated art paper (approx. 170 g/m2), which is FSC-certified. These spiral-bound calendars are available in landscape format DIN-A5 (Desk Calendar), as well as DIN-A4 and DIN-A3 (Wall Calendar). Being a so-called perpetual calendars, they are timeless and long-lasting. They can be used for years and not only adorn any room but also provide each month with a new species for the viewer. Beside this English editions, there are also German editions available. All calendars can be ordered from European bookstores. This special offer is only vallid as long as stocked. 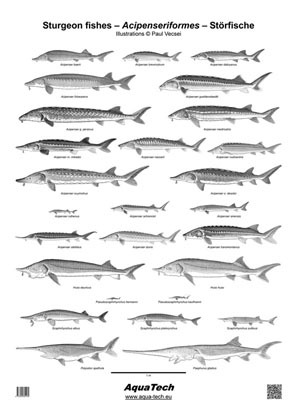 Paul Vecsei, well known sturgeon specialist and fish illustrator, shows in this poster all extant sturgeon species and valid subspecies worldwide, using 27 scientific illustrations. Each picture is of an individual fish and was made in the technique of pointillism with extreme accuracy. This poster in DIN-A1 format (594 x 841 mm) on 250 g/m2 paper finished with UV-gloss coating, is not only a decoration on any wall but also an eye-catcher which will satisfy the viewer. The delivery includes two black poster rails made from plastic material for easy wall mounting. The poster is available from bookshops or directly from the publisher (online order form). Posters of single species or with your promotional text/logo (in size DIN A0 to A4), on request! 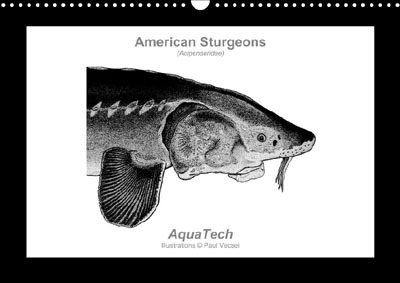 American Sturgeons (Acipenseridae): Fish as Art. Desk Calendar DIN-A5 Landscape (210 x 148 mm), ISBN 978-3-660-31797-8 (EUR 30,- excl. VAT). Wall Calendar DIN-A4 Landscape (297 x 210 mm), ISBN 978-3-660-31798-5 (EUR 40,- excl. VAT). Wall Calendar DIN-A3 Landscape (420 x 297 mm), ISBN 978-3-660-31796-1 (EUR 50,- excl. VAT). 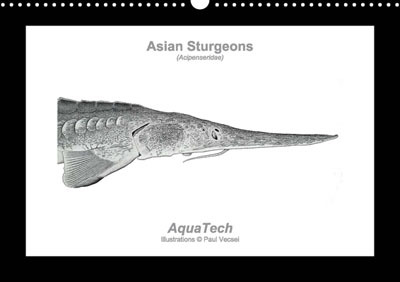 Paul Vecsei, a well known sturgeon expert and fish illustrator, shows in this calendars some of the interesting diversity of sturgeons (Acipenseridae), featuring 13 scientific illustrations. Each image represents an individual fish and was executed in detail in the technique of pointillism. The calendars are printed in the actual ISO standard, on high quality multi-coated art paper (approx. 170 g/m2), which is FSC-certified. These spiral-bound calendars are available in landscape format DIN-A5 (Desk Calendar), as well as DIN-A4 and DIN-A3 (Wall Calendar). Being a so-called perpetual calendars, they are timeless and long-lasting. They can be used for years and not only adorn any room but also provide each month with a new species for the viewer. Beside this English edition (American Sturgeons), there is also a German edition (Europäische Störe) available. All calendars can be ordered from European bookstores. This gas powered cannon scares by 120 dB "shots" away birds and other pests from ponds and fields and therefore reduces mortality. 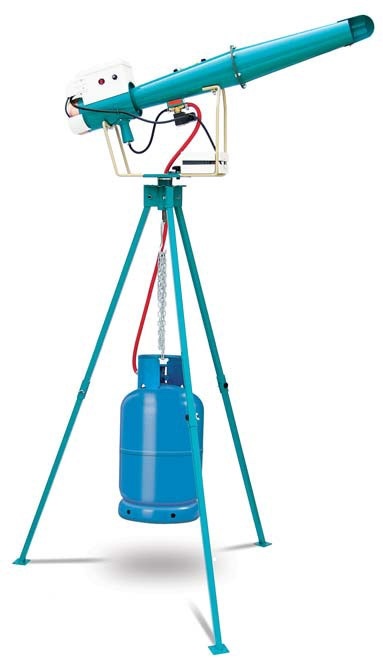 It works with a small or large propane gass bottle (approx. 18,000-22,000 shots/12 kg gas cardridge) and has a protection area of about 4000 m2. The cannon is available as manual or automatic version. The automatic version has a battery and timer, which allow a timing of 2-20 minutes, as well as random shots. As accessoire a fixed or turnable tree-leg support-stand is available. The delivery excludes the gas cardridge. This ultra violett sterilizers utilize germicidal lamps which emit UV-C with an effective wavelength of 254 nm, lethal for up to 99.9 % of bacteria, viruses and other microorganisms present in the water. This ultraviolet technology is one of the most effective method of water treatment and purification, without using any chemicals. The effective UV Dose is: UV-Dose (µW.S/cm2) = UV-Intensity (µW/cm2) x UV-Exposure (S). The maximum operating pressure is 7 bar and the average lamp life is about 9000 hours. The supplied (internal or external) ballast has an indicator to check the function of the lamp. 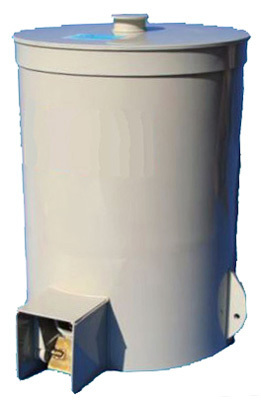 The immersion UV-sterilizers are used under water, particularly in water tanks to prevent secondary infection and pollution. They have a diameter of min. 25 mm and max. 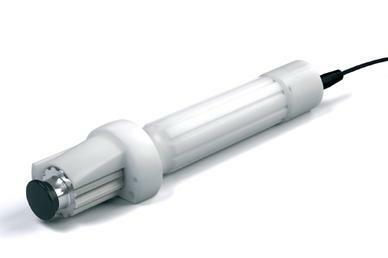 40 mm, and are easily installed in any tank so that operation is very simpe. 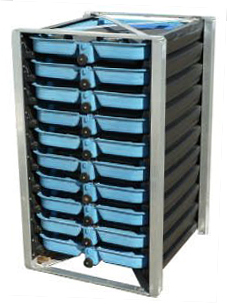 The inline UV-sterilizers are used out of the water, particularely in hatcheries to prevebt primary infection and pollution. The inside wall of the stainless steel chamber is polished, which helps to improve the efficiency of disinfection by reflection. Larger systems with 2-11 lamps on request. All this new waterproof (IP67) and electronic GMH devices with silicon cover have a size of 160 x 86 x 37 mm (LxWxD) and a weight of approx. 250 g (incl. 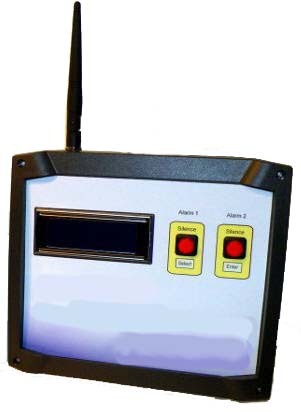 battery/cover), have a LCD doubble display for measured values and temperature, min-/max-value memory, configurable automatic switch-off function (1-120 min), hold-function, foil pushbuttons, backgroud illumination, serial connetion, automatic temperature compensation, 12 mm ø sensors, battery with warning. This meters are available with or without analog output with alarm and logger function as well as realtime clock. Tansport boxes are available as accessoire. Due to the huge flood in various countries in central Europe, we give all affected people or companies (confirmation of the commune) a special discount of -20% on replacement items and -10% on new items, off our list prices (discount vallid until end of September). please note that, from last year (2011) onward, we will update our AquaTech NEWS only yearly and post special offers unregularely. Additionally, our website was updated with new design, better pictures and more text. or order as paperback (for US$ 6,-). Cleaning fish from scales with the help of a knife due to tradition is not a pleasant work and takes quit a lot of time, energy and nerves. But luckily there is a solution  it is the electric fish scaler! This compact, silent and lighweight (just 1,2 kg) device makes the process of de-scaling fish easier and faster as it is simple and safe while using. It ceans fish instantly and doesnt damage the skinn or meat. 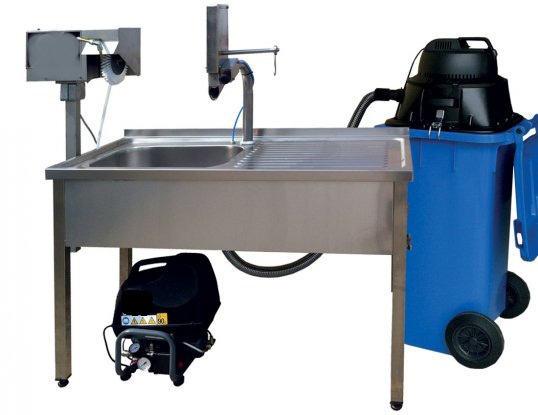 It doesnt only clean fish but also collects scales, so your working area is not covered with fish scales and you dont need to wash tables, walls and sink. After use it is necessary to unplug the device, clear the scale collection tank, and wash and dry the cutter drum throughly. The cutting drum has a rotating diretion to the left (3000 rpm), the energy power is 20-40 Watt, and the working temperature ranges from -10 to +50 °C. 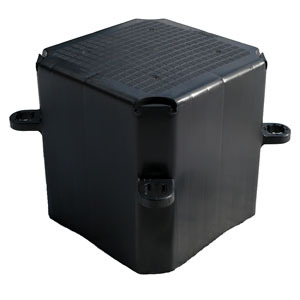 The device is delivered with electric cable and plough, as well as transformer and adapter, so it can work with the help of electric mains of 220 V AC and a car cigarette lighter socket of 12 V DC, that gives the opportunity to clean fish in open air. Cleaning fish is becoming a pleasant and fast activity without any physical efforts. This fish scaler has become very popular now as it is an indispensable helper to housewives, fishermen and restaurant staffs. AQUA 2012 - "Global Aquaculture - Securing Our Future" - International Conference & Exhibition organized by the European Aquaculture Society and World Aquaculture Society. 2-4 September 2012, Booth Nr. 52, Prague Congress Centre, Czech Republic. More information! please note that, from this year (2011) onward, we will update our AquaTech NEWS only yearly and post special offers unregularely. This multichannel process control and management system is a very versatile instrument that can be used as a stand-alone wirless and solar powered multi channel controller for cages, ponds, tanks and raceways, etc. If there are more than 1 monitor units and a base station receiver, then the system automatically configures as a network and sends the information by low powered wireless communication to the base station. The base station has 2 alarm outputs, so it is easy to connect it to a telephone dialer or a local alarm. The base station connects to a PC via a USB, so now you have all the information displayed on your PC and all the results can be data logged. You can add up to 50 monitor units onto the one base unit, to make a 100 channel network with no wires and no installation costs. 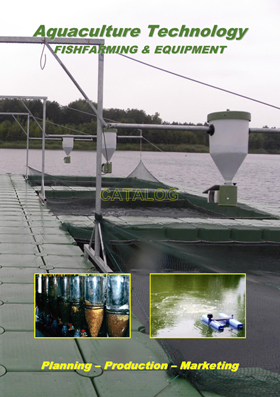 This makes for a really low cost simple system and for the first time provides a package ideal for cages, ponds or for any installation that can not use wires. In the event that you get hit with lightening, then generally only one unit will be affected, and if it can not be repaired on-site then you simply send the faulty unit back and replace with a working unit. This means that you are in control of your own system and not dependent on service engineers. 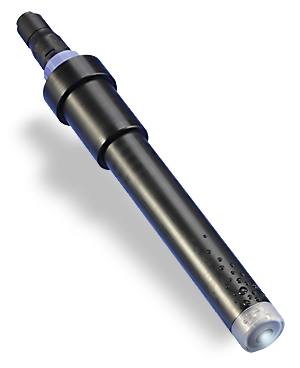 The robust and easy to use (60 mm large) oxygen probe is a self polarising membrane covered galvanic cell that generates an electrical signal proportional to the oxygen pressure it senses, no matter whether it is in water, air or another medium. It is connected using ordinary 2-core cable, which can have any length (up to 1000 m) and does not need an external supply because it makes its own electricity. Cleaning the membrane (with a cloth or tissue) is, apart from an occasional calibration, the only routine maintenance necessary. The probes are robust, reliable and as stable as an optical probe but at a much lower price. 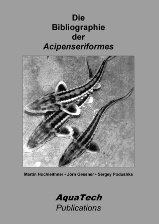 The book aims at synthesizing our current knowledge of Acipenser sturio and its management. 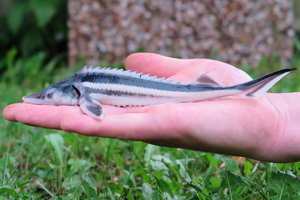 This species, one of the most widespread sturgeon species all over Western Europe ranging from the Black Sea to the Baltic, is now on the verge of extinction. Major aspects of its biology and management, including mismanagement, are provided in a historic perspective. Similarly, the changes in the restoration programs (in situ and ex situ) initiated in France and Germany are presented. As the species occurred in sympatry with Acipenser oxyrinchus in Germany and Poland and very recently in France as well, a brief outlook on restoration-management programs of A. oxyrinchus are also provided for both North America and Northern European countries, namely Germany and Poland. As conservation-restoration actions go beyond scientific issues, non-governmental stakeholders and marine professional fishermens organizations have also been asked to contribute, and the key role of a French-German cooperation plan is underlined. A part of the book is devoted to perspectives. Illustrations of the European sturgeon, mainly in photographs, but also in stamps and paintings, are presented.